Once again, William Cross is making a name for himself in the business world after bringing home another prize from a national business plan competition. This time, William earned third place out of 170 teams and a total of $40,000 in prize money from Baylor University’s New Venture Competition. 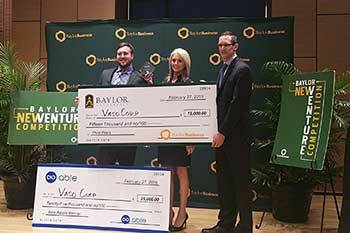 The fourth annual Baylor New Venture Competition was a two-day, dual round business plan competition and speed pitch competition promoting entrepreneurship and small business development. At such events, students are sponsored by their home universities and present a business plan for their product to a panel of judges. The competitions provide students with feedback on their products and business plans as well as the opportunity to network and win prizes to help fund their ventures. Representing the University of West Georgia, William earned $15,000 from Baylor University for placing third as well as $25,000 for winning the Able Award. William will invest the prize money in his company VasoCorp, which produces NeuropAWAY. NeuropAWAY is a dietary supplement formulated to reduce neuropathy, or nerve pain, in diabetic patients. William is currently pursuing his bachelor’s in business administration at UWG’s Richards College of Business. He works with the University of Georgia Small Business Development Center (SBDC) at the University of West Georgia to shape and develop his company and his product. UWG’s Rick Sigman, a business consultant at the SBDC, says a good support system is vital to business success, and he’s glad to be a part of that support system for William. Rick says business plan competitions held across the United States, six of which William has attended, are also a great place to make connections and establish relationships with mentors and investors. William has made several connections at these competitions. He has successfully obtained an angel investment of $70,000, which enabled him to mechanize production of his product and increase output several times over. As a result, he is now filling orders for several Atlanta-area pharmacies. William has two more competitions lined up this year at Rice University and Georgia State University. He has been accepted into the Georgia State competition and is still trying to qualify for the Rice University competition.